Are you noticing a theme around here? In case you can’t tell, I’m pretty much breakfast obsessed. Of course part of it has to do with the release of my next eCookbook, Quinoa for Breakfast, but really it’s just the fact that we all love breakfast. I mean, I think we could talk all day about how awesome breakfast is, right? It’s the best. is it nutritious and balanced? But for reals, if you are someone who is focused on eating healthy food, then I’m sure you know how important breakfast is. And you probably think about those same things as you're planning your morning meal. But I feel like where most people get hung up is the time. It’s such a common misconception that making a healthy breakfast has to be time consuming. That couldn’t be farther from the truth! 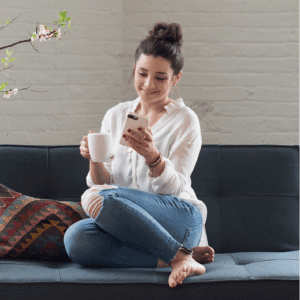 And it’s actually one of the main reasons why I wrote Quinoa for Breakfast – to give you TONS of breakfast options that aren’t going to take a ton of time to make. 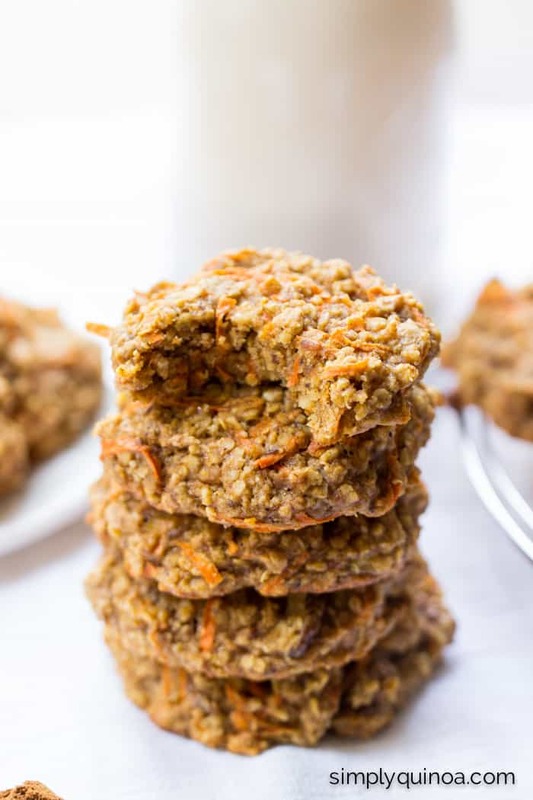 Time is also one of the reasons why I love having quick breakfasts on hand, like my Zucchini Bread Quinoa Breakfast Cookies. 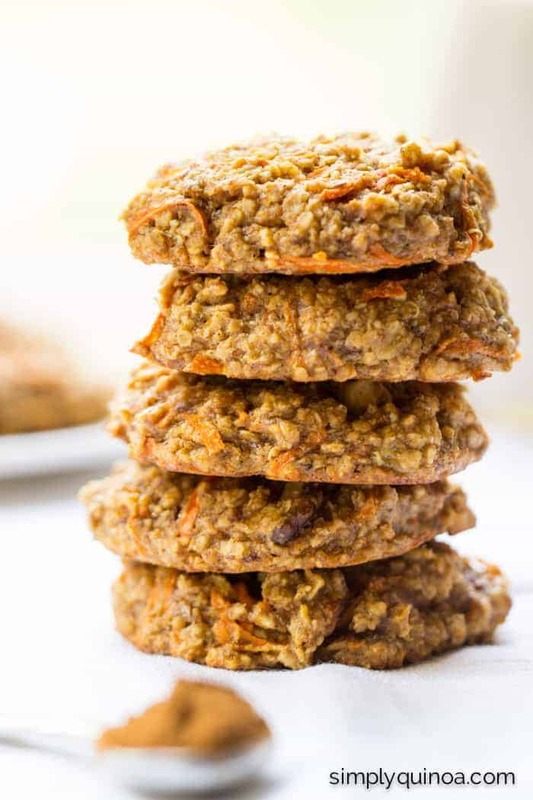 Breakfast cookies are a quick, on-the-go breakfast option that are seriously packed with nutritional superstars! 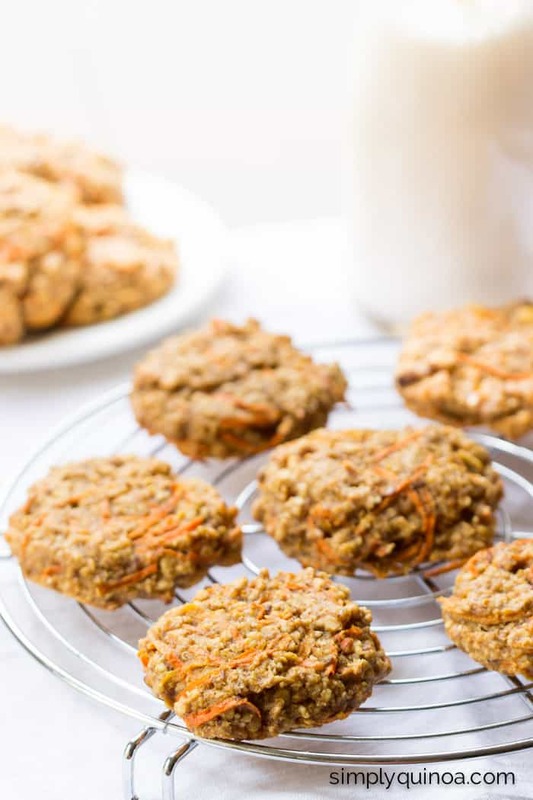 They’re also fairly forgiving so you can really play around with flavors and ingredients to make them your own (my Toasted Coconut Quinoa Breakfast Cookies and Carrot Cake Quinoa Breakfast Cookies are both the same base, but a different flavor profile!). Carrot cake has always been one of my guilty pleasures, but it’s also super unhealthy. Loaded with sugar and processed oils, the carrot cake you buy at the store is something you definitely should steer clear from. 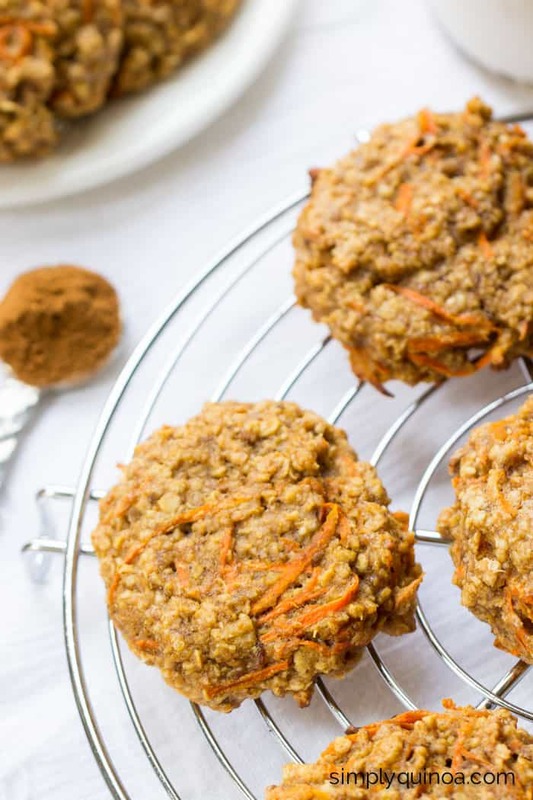 These cookies not only make carrot cake healthy, but they also make carrot cake breakfast-worthy. And when you can have dessert for breakfast, that’s a total win, right? I mean these little bites of dessert-flavored heaven are filled with healthy ingredients. 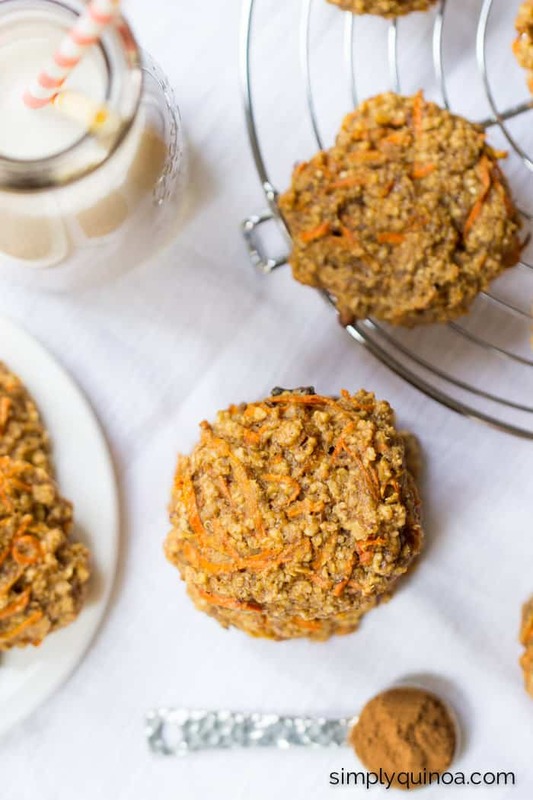 We’ve got oats, quinoa flakes, banana, cashew butter, flaxseed meal, maple syrup AND carrots. 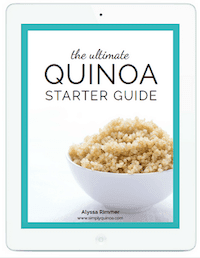 ALSO, I know I've mentioned this a few times before, but if you don't already know, I'm releasing my new eCookbook, Quinoa for Breakfast, this coming Tuesday (9/15) I've just released my new eCookbook, Quinoa for Breakfast! It features 90 recipes, 150+ pages and is packed full of healthy breakfast inspiration. I know you're going to love it! Whisk together the flaxseed meal and water, and set aside. Beat together cashew butter, syrup, banana and vanilla in a large bowl. Add flax egg and mix to combine. 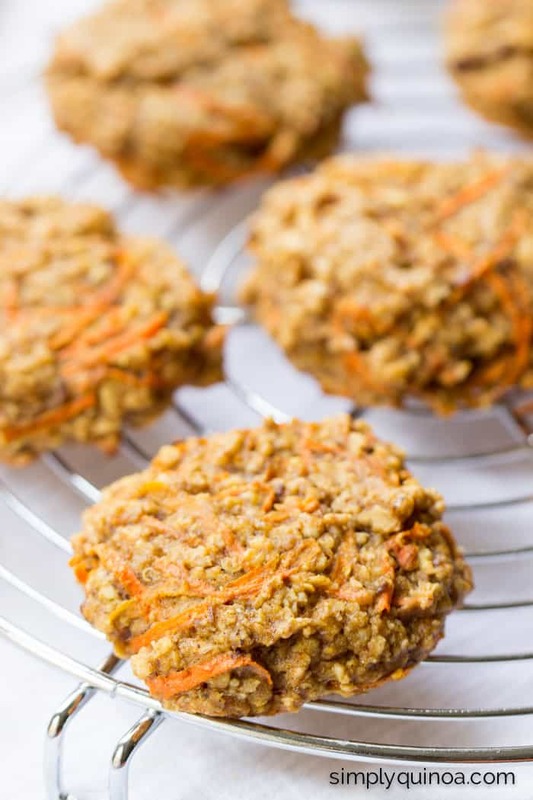 Pour in oats, quinoa flakes, baking powder, spices and salt to the bowl and stir together. 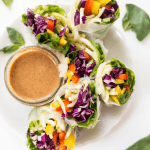 Fold in shredded carrots and walnuts. Drop 2 tablespoons of dough onto the baking sheet and repeat until no dough remains. Bake cookies on center rack for 15 - 18 minutes until edges are golden brown. Remove and let cool on the pan for 5 minutes then transfer to a wire rack and cool completely. Enjoy at room temp or slightly reheated in a microwave. Probably a silly question but can I just use a regular egg? Nut and oats allergy here, what would you use to substitute cashew butter and oats? I think you could do more quinoa flakes and use sunflower seed butter instead! 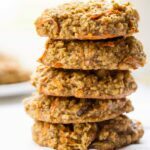 Would you suggest a 1/2 cup extra of quinoa flakes to fully replace the oats? Or something different? Loved this recipe, added 1/2 cup coconut flakes I’ve been trying many recipes for healthy treats for my grand babies . These are best so far, very good, I’ll have kid test tomorrow. Thanks! Can you use quinoa flour instead of flakes? I haven’t tested it with flakes, but if you do, I would say try 1/4 cup! Alyssa, at the moment I have lots of uncooked quinoa and oats flakes. Can I use this as well? Great recipes by the way! I haven’t tested it this way, but I think it’s worth a shot! Thanks Alyssa, which quantities would you advice for the uncooked quinoa and the oat flakes? I haven’t tried, but I think so, yes! Carrot Cake for breakfast? PLEASE sign me up for this. 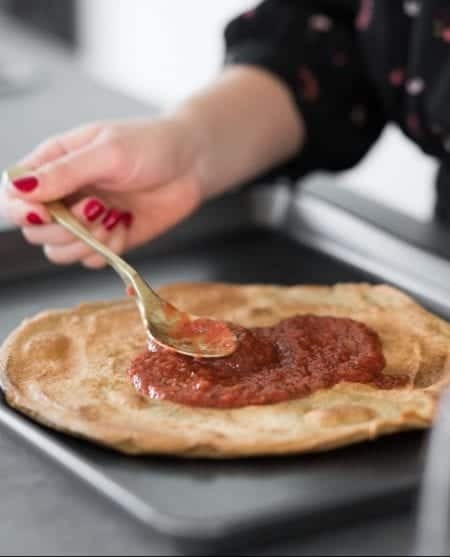 Hmmm you could try another fruit puree, but I think you’re going to have to adjust some of the other dry ingredients to help them bind. Maybe toss in a bunch more chia and let the batter sit. Another option might be to try chickpeas. I know it sounds strange, but it might work! Let me know if you end up trying something that works! I, too, would like to know if Quinoa would work instead of flakes. 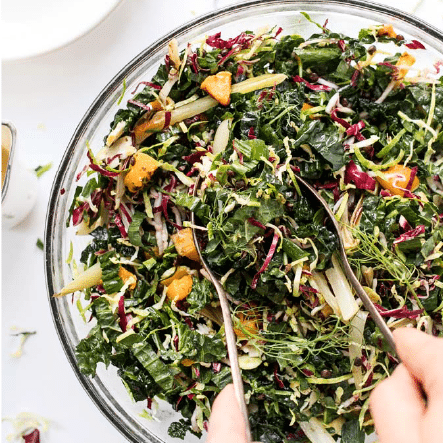 I bookmarked this page a while ago, and just went to add these to my menu plan for this week since I have quinoa on hand, when I realized it calls for the flakes (which I haven’t the slightest idea where to get)! Thanks for letting us know the answer! Can I use regular quinoa if I don’t have flakes? Can you please tell me how many calories per cookie? @ 100 calories as listed with all ingredients. i added a chocolate drizzle.